Viewing 24 of 63 items. 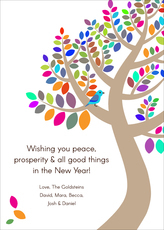 Set of beautiful holiday cards featuring a tree of life are perfect for wishing friends and family a happy Jewish New Year. Flat printed cards with matching blank envelopes. 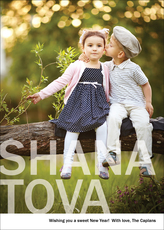 Optional envelope linings..
A set of beautiful photo L'Shanah Tovah holiday cards featuring a foil embossed design. Your choice of foil color for design. Blank envelopes included. Optional envelope linings available. 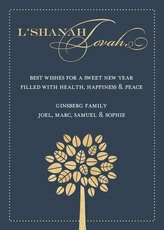 Card..
A set of beautiful L'Shanah Tovah holiday cards featuring a foil embossed design amidst a gorgeous floral. Your choice of foil color for design. Blank envelopes included. 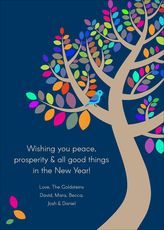 Optional envelope..
A peaceful Jewish New Year greeting to send to friends and family. Matching blank envelopes included. Optional envelope linings available. Card size is approximately 7" x 5". 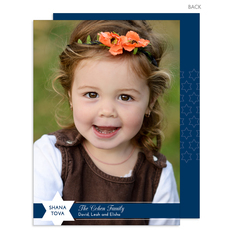 Printed return..
Modern set of Jewish New Year cards with your personalization. Blank envelopes included. Optional envelope linings available. Card size is approximately 7" x 5". 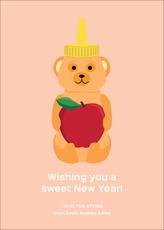 Printed return address in..
Sweet New Year blessings are easy to give with this adorable Jewish New Year card. Set of modern and whimsical flat holiday cards with matching blank envelopes included. 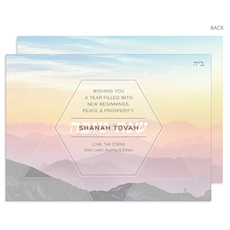 Optional envelope linings..
Share your Rosh Hashanah New Year greetings with friends and family with this set of flat Photo Jewish New Year cards with matching blank envelopes included. Optional envelope linings available. 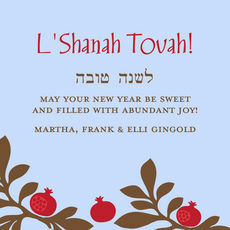 Card..
Lovely Jewish New Year cards to send to friends and family which also include your photograph. Comes with matching blank envelopes. Optional envelope linings available. 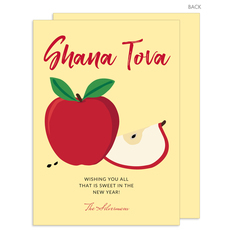 Card size is approximately..
Sweet and pretty holiday cards to wish your favorite people a happy and healthy Jewish New Year. 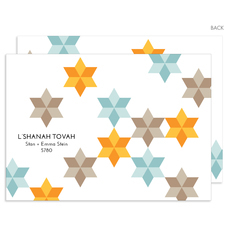 Set of flat Jewish New Year cards with matching blank envelopes included. 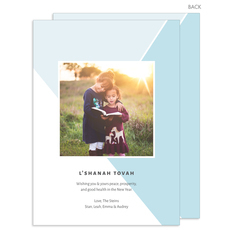 Optional envelope linings..
Share your New Year greetings with friends and family with this set of flat Photo Jewish New Year cards with matching blank envelopes included. Optional envelope linings available. Card size is..
A perfect card to send your Happy New Year greetings to friends and family on Rosh Hashanah this year. Set of modern and fun cards flat printed with matching blank envelopes included. 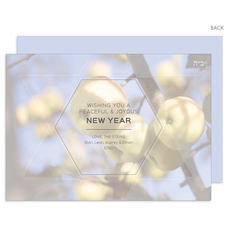 Optional..
Set of classic flat Jewish New Year cards with matching blank envelopes included. Card size is 5" x 7". Printed return address available. Imprint is flat printed in ink color as shown. 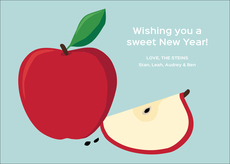 Cards..
A sweet apple is perfect for your Jewish New Year holiday cards. Blank envelopes included. Optional envelope linings available. Card size is approximately 7" x 5". 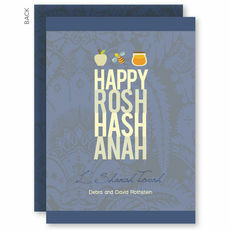 Printed return address in..
Set of 20 flat Jewish New Year cards with matching blank envelopes included. Card size is approximately 5.25" square. Printed return address available. 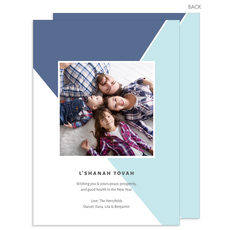 Imprint is flat printed in ink color and..
Share your New Year photo with friends and family with this set of modern flat Photo Jewish New Year cards. Matching blank envelopes included. Optional envelope linings available. 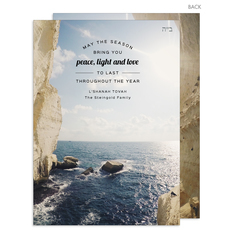 Card size is 7"..
Set of beautiful holiday cards perfect for Jewish New Year. Flat printed cards with matching blank envelopes. Optional envelope linings available. Card size is 5" x 7". Printed return.. 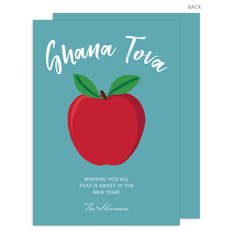 Pretty Jewish New Year cards featuring an natural apple theme. 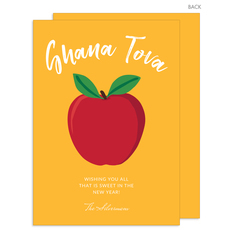 Set of flat Jewish New Year cards with matching blank envelopes included. Optional envelope linings available. Card size is approximately..